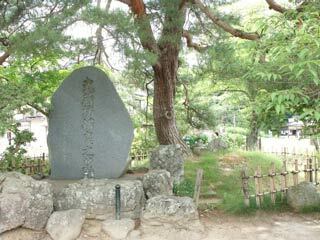 The grave of Musashibo Benkei (武蔵坊弁慶の墓) is located at the entrance of Chusonji. Benkei is the loyal warrior of Yoshitsune, and of the most famous warrior in Japan. In 1189, he protected his lord Yoshitsune and fought until his death. He died in standing. It's called "Tachiojo." After that, the priest of Chusonji showed respect to him and he was buried here. he wrote a poem for him. "Irokaenu Matsunoarujiya Musashimo." "Musashibo, the lord of this pine tree will never change his color." There is no parking and resetoom, but you can visit here when you visit Chusonji. Benkei is one of the most famous warrior in Japan. He was loyal servant and guardian of Yoshitune. Legend said, Benkei and Yoshitsune fought at Gojo bridge in Kyoto. Yoshitune beat Benkei, and after that he became the guardian of Yoshitsune. He followed Yoshitsune all the time, and at the last when Yasuhira betrayed Yoshitsune and tried to kill him, Benkei fought for Yoshitsune until his death. He was shot by many arrows and killed. However, even he was already dead, he never fell down and kept standing to protect his lord Yoshitsune. He was protecting him even after he was dead.